The Rakuten Technology Conference 2010 - Hello, World! - is the 4th annual Rakuten Technology Conference which has started since 2007. In the past 3 years, this event mainly introduced technologies and development cases inside of the Development Unit (DU) of Rakuten, Inc. However since this year, the Rakuten Technology Conference will become an opened conference for general web technologies. So that more guest speakers outside of Rakuten will be invited. The subject of Rakuten Technology Conference 2010 is "Global". 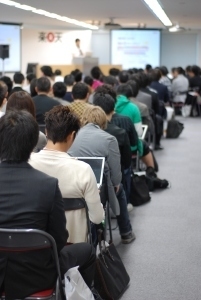 A number of sessions about those technologies and topics, which attract attention both inside and outside of Japan, have been scheduled in this event. The keynote speech will be given by Mr. Mikitani, the CEO of Rakuten, INC., and Mr. Matsumoto a.k.a. Matz, the chief designer of the Ruby. They will share their opinions at the beginning of the conference. In talk sessions, some engineers who are active in global stages will discuss about the future of Japanese engineers with all attendees. In addition, the lighting talk session, which gained a good reputation last year, will be held this year as well. Anyone are welcomed to make presentations to introduce their applications or ideas in this session. As we all know, in recent years the more and more fast innovation of the web technology has a significant impact on the IT industry and engineers. With a sub title "Hello, World", the objective of this event is to give new inspiration for all IT engineers attended. We hope we can be more active in the global stages in the near future. Welcome to the Rakuten Technology Conference 2010 - Hello, World! -. Copyright(c) 1997-2010 Rakuten, Inc. All Rights Reserved.